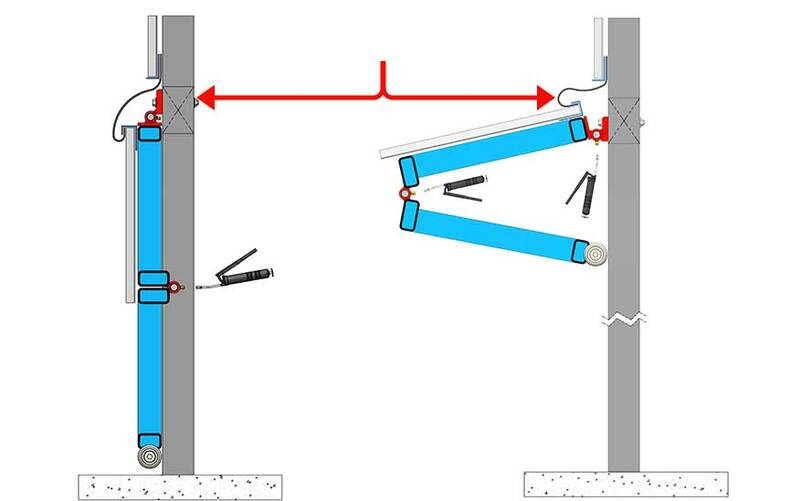 The most obvious "market shaking" improvements for the Bifold Door is the addition of the patented lift-straps along with the new strap autolatch systems, two features not offered by any other door manufacturer. Schweiss Lift Straps have revolutionized the door world by opening and closing much more quickly, quietly and effortlessly. Not only are they safer, but they're also easy to install and much longer lasting. It's a win-win for the customer and strap doors are leading the market in the door world. 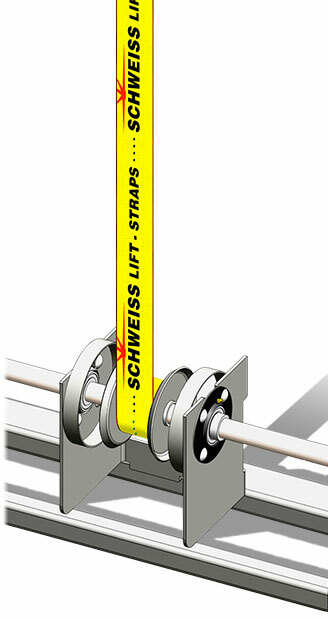 Schweiss Patented Lift Straps! Schweiss Doors of Fairfax, Minnesota, USA have been on the market for over 38 years. We manufacture two great styles of doors, the Schweiss Hydraulic Doors and the famous "Lift-Strap" Bifold Doors. What some people don't know is that Schweiss Bifold Doors evolved with the times and many improvements have gone into them, creating a product that everyone is wanting! Bifold Doors keep getting better and better! 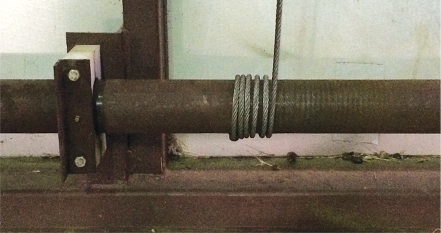 are not as reliable as straps, and are noisier than liftstrap doors. Straps are a better design ! P.S. Has anyone ever converted a strap door back to cables . . . I don't think so! Offsetting the cables during lifting of a bifold is a great concept, until your cables don’t have the proper tension. Then you end up with messed up cables again! Unlike straps that wrap on top of each other. 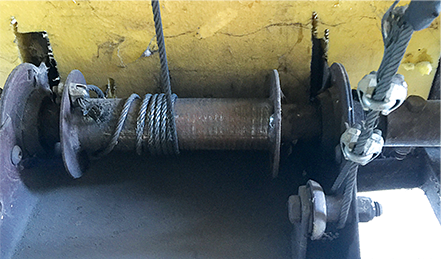 Tension is never an issue with lift straps nor do they get messed up. Straps are a perfect design... trouble free. Using lift straps saves you from all those headaches. Schweiss Lifts straps have proven to be by a far superior method of lifting any bifold door. Lift straps wrap on top of themselves by design, elimnating any common cable issues, like overlapping, rubbing and fraying. Lift straps are much quieter than cable doors! YES, "STRAP CONVERSION KITS" ARE AVAILABLE. "THE WORD IS OUT!" Schweiss will do strap conversions on other brand bifold doors, no matter the make or model. 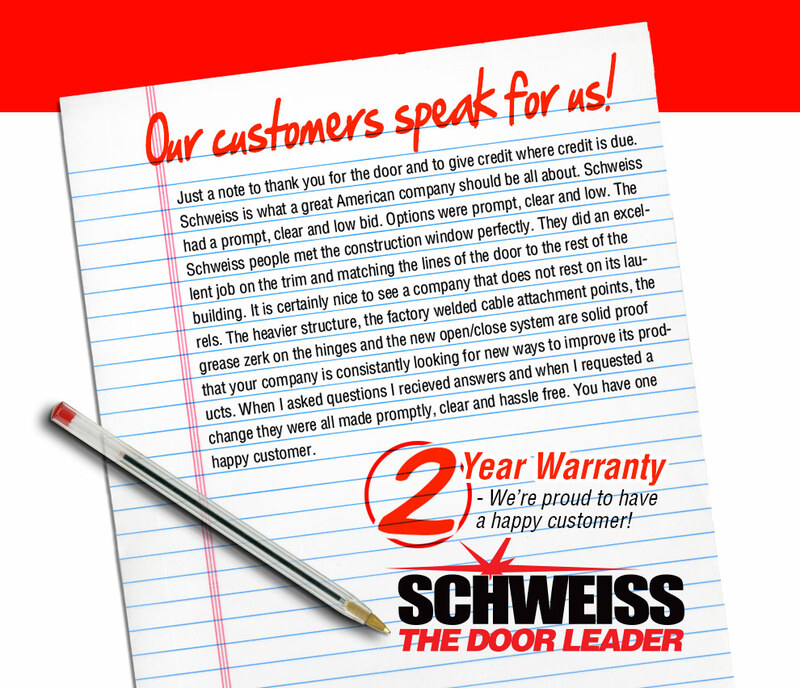 Schweiss has received thousands of calls from existing outdated cable bifold door owners wanting to retrofit their outdated cable door system to the "Schweiss Patented Liftstraps"
The bifold doors have been around for many years and the unique design has made Schweiss bifold Doors the leader in the market. Schweiss Bifold Doors have design features built into the door that make the bifold door stand out in a class of its own. Below we list some of the designs that make the bifold a good choice. The bifold door frames are raised open with our patented heavy-duty lift straps that are evenly located throughout the entire door frame to provide even lifting of the door frame. 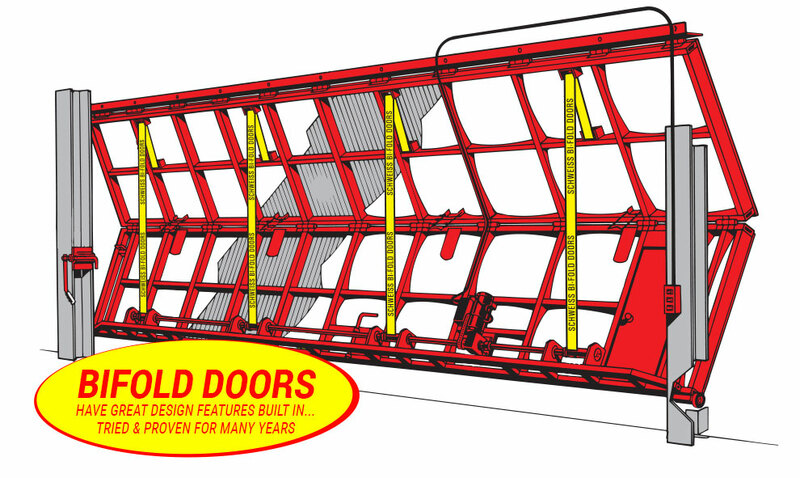 bifold doors are lifted upward with nylon lift straps rated at 29,000 lbs tensile strength. The nylon straps attach to the bottom of the door frame at multiple locations that provide even lifting of the door frame. These straps never bind or make noise like a cable lift door. • Lift straps wrap in on a spool to raise and lower, increasing the operating speed and make a very quiet door. 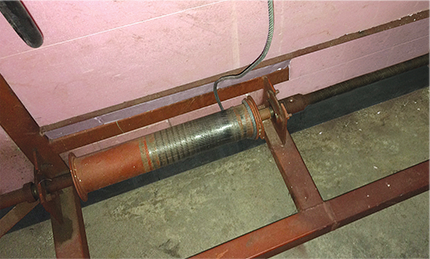 • Lift strap doors DO NOT require pulleys. A very nice design. Less parts, less problems, less maintenance. • Bifold doors have 2 sections, a top half and a bottom half that provide many design advantages. • A two section door hangs out half the distance of other doors - putting less stresses on your building. When a bifold opens the door frame folds into a “V” or a wedge acting as a huge truss supporting each of the two bifold door sections. The larger the wedge the less stress it exerts onto the building structure. Bifold doors are designed with 2 sets of hinges to share the loads of the the door frame. Schweiss believes in strength and safety. Our door in the open position has multiple lift points that evenly support the door. 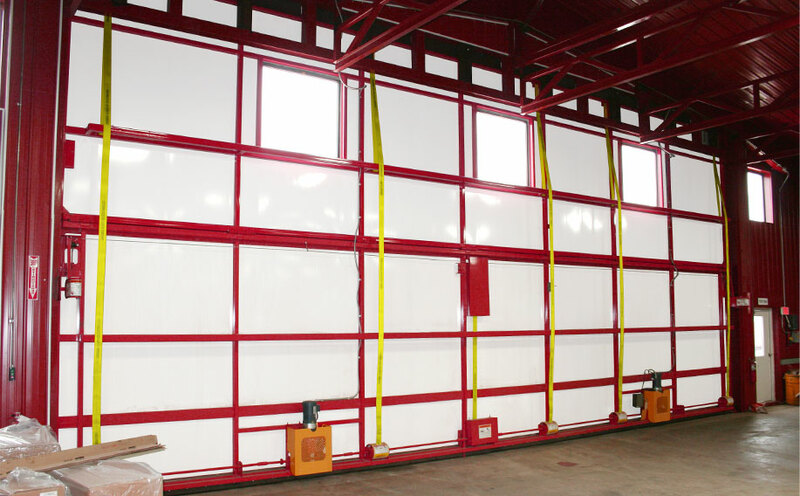 The multiple lift points are spaced evenly across the entire width of the door frame that attaches to the building structure, carrying the door loads more evenly to the attaching points on the building resulting in less stress on the building. Bifold doors when in the full open position have a slight slope to provide drainage to your door... The unique design is standard on all Schweiss Bifold Doors... and is the only door on the market that allows any moisture, water or snow to flow off the door section in the open position. 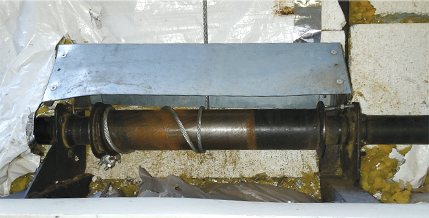 When a door is mounted on a side wall of the building all the roof moisture that comes off the building onto your open door must be able to flow off the door covering. This is all possible with a bifold door because of the natural slope built into the bifold door wedge. Bifold doors have a huge advantage when opening, they start by raising upward, requiring less operating space in the front of your building. The area in front of your large door opening is very valuable space, the 2 piece bifold allows more usable space in front of your door opening. Bifold doors are simply a real space saver. • Our Bifold Doors will work and work and work!! No Sagging - No Bowing! "Automatic Bifold" doors are the customers popular choice. 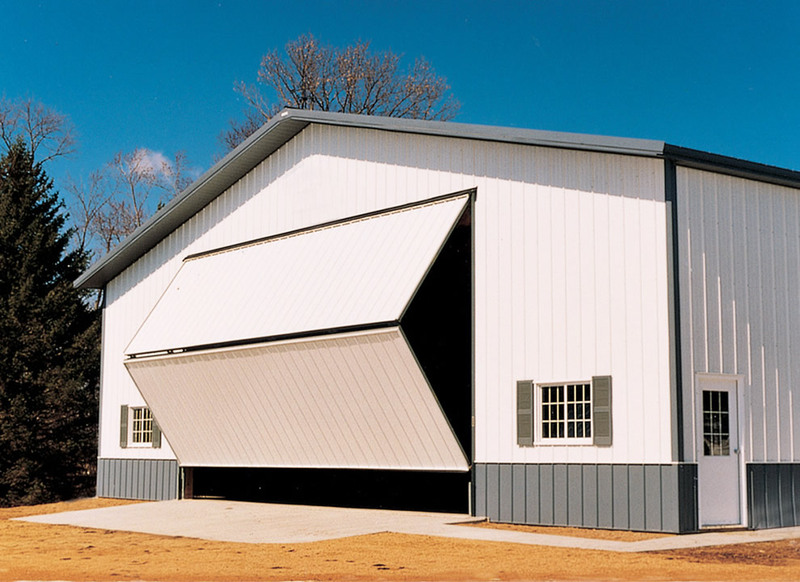 No longer is it necessary to spend wasted time tugging and pulling on sliding hangar doors. The common complaints about regular doors are; They're too large, they're sagging, they're bowed, I can't insulate them decently, it takes two people to open them, in the winter I spend many back-breaking hours shoveling snow away to open my doors, I'm sick and tired of chipping ice away to get my doors open. A very common statement is, "I love my building, but hate my sliding doors." BIFOLD DOORS HAVE BEEN TRIED AND PROVEN FOR MANY YEARS! IT USED TO BE THAT CABLES WERE YOUR ONLY OPTION BUT NOW . . . HERE ARE SOME REASONS WHY . . .
Cables are rated for only 7,200 lbs! With cables, you have to deal with the cable clamps - proper tension on the cables is critical! 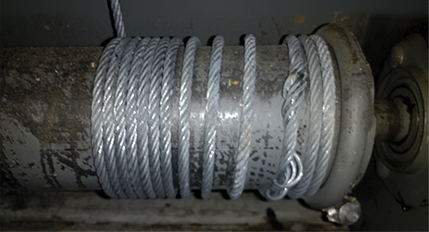 Cable doors require more maintenance, have a shorter working life, are slower, wear out sooner and aren't as safe as straps. WHY WOULD ANYONE WANT A CABLE DOOR?